The first live performance of The Steve Hillage Band in 25 years! The Gong Family Unconvention at the Melkweg club in Amsterdam in November 2006 was a unique 3 day event in which all the original members of the legendary psychedelic band Gong came together and performed their own individual sets. Guitar legend Steve Hillage, who was a prominent part of the "classic" Gong line-up of 1973-75 felt it was a great opportunity perform again some of the songs from his 1970s solo albums. Steve Hillage is widely considered a guitar innovator, and is associated with the Canterbury scene, working in experimental domains since the late 1960s. Besides his critically acclaimed solo recordings, along with Gong, Steve has been a member of the ensembles Khan and System 7. 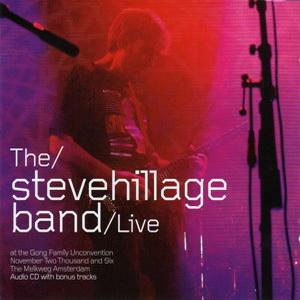 Steve's live set at the Gong Family Unconvention in 2006 provoked a rush of excitement and emotion at the event, and this was beautifully captured on film and recording - and is now available on this DVD and CD. Performing with Steve were his long-time musical partner Miquette Giraudy on synthesisers, Gong bass player Mike Howlett who played on Steve's 'Fish Rising' album from 1975, and Gong drummer Chris Taylor who started playing with the band in the 1990s. Also guesting was Basil Brooks on synthesiser, who played in Steve's band in the '70s. In addition the audio CD has 4 exclusive bonus tracks from Steve's 1970's archive. The DVD has bonus material in the form of a substantial interview with Steve and Miquette, and background clips from around the Gong Melkweg event. The audio for the CD and DVD was mixed by Steve in his A-Wave Studio and has a rich, warm sound. The video DVD was edited and authored by long time friend and Gong family member Harry Williamson in his Spring Studio in Melbourne Australia. The artwork was put together by Z3 who do the artwork for Steve and Miquette's dance music project System 7. If indeed Steve does create some more music in the psychedelic rock sphere this powerful and unique live recording can be seen as a launch pad. Steve currently sees his System 7, Mirror System, and Steve Hillage Band entities as operating in parallel and has been writing some new rock-based material for a possible Steve Hillage Band album for release in 2013/14.